“Both the youth and adult education tiers include establishing a working group to develop/source road safety curriculum for the primary level, reviewing the existing Project Ride program, engaging the business community on road safety, and establishing a mandatory DUI education policy just to name a few. “We will be hosting several town hall meetings to share the plan with the public, as well as conducting “street” interviews,” Mr Minors said, adding that they wanted to provide the youth with an opportunity to engage in the road safety discussion so have created a Road Safety Video competition for teenagers. The Ministry of Transport is pleased to announce the launch of the Road Safety Plan 2018. I am pleased to be joined today by The Hon. Wayne Caines, Minister of National Security, Chairman of The Bermuda Road Safety Council, Dennis Lister and Transport Control Department Road Safety Officer, David Minors. The issue of Road Safety is a consistent problem for the island of Bermuda. Thousands of road users annually are involved in avoidable traffic collisions due to speeding, drunk-driving, and carelessness on our roads. Without question, this Government is extremely concerned with the amount of road collisions that have occurred over the past few years. Just last year, one thousand two hundred and forty [1,240] road-traffic collisions were reported to the Bermuda Police Service, with 64 resulting in serious injury and 15 being fatal. With the introduction of the Road Safety Plan, it is our aim to introduce measures which will bring awareness, shape behavior and yield safer road conditions for all motorists. The Road Safety Plan 2018, entitled Operation Caution, has been created as a tool to introduce aggressive initiatives and policies aimed at combating the issue of road collisions in a systematic and collaborative way. And phase 2, which will be the substantive portion of the plan, seeks to curb unsafe road behaviors through the education of good road safety practices. This strategy includes input gathered from focus groups and stakeholders. We also researched other jurisdictions that have faced similar problems. Through the implementation of the Road Safety Plan 2018, it is our goal, as the Ministry of Transport and Regulatory Affairs and the Government of Bermuda, to create safer roads and a safer Bermuda. I will now turn it over to Road Safety Officer David Minors who will provide an overview of the key features of this plan. The Bermuda Road Safety Council stands here today to fully endorse the Road Safety Plan 2018 “Operation Caution.” As driving habits on our roads have become increasingly more hazardous and collisions more frequent, it is imperative that we do all that we can to address the situation. The commitment shown today from the Minister of Transport and Regulatory Affairs as well as the Minister of National Security is encouraging as we move forward with implementing the plan. Changing driving habits is not an easy task; however, we must all commit to be part of this new shift in mind-set. Education is a large component of the Road Safety Plan 2018 “Operation Caution.” We understand that road safety education should start as early as possible. New road users will then be ably equipped with safe road habits. These habits will form behaviour and ensure a healthy respect for the roads. “Operation Caution” will be a blueprint for us to follow and we encourage the public to come out to the town halls, get informed and be a part of the process to change our driving culture. Features of the plan include increased Bermuda Police Service presence throughout the island, introduction of Stop Light cameras, speed limit warnings, several targeted marketing campaigns focused on the causes of collisions, and curbing dangerous behaviors. Both the youth and adult education tiers include establishing a working group to develop/source road safety curriculum for the primary level, reviewing the existing Project Ride program, engaging the business community on road safety, and establishing a mandatory DUI education policy just to name a few. All meetings begin promptly at 7pm nightly. The “Street” Interviews will take place in the city of Hamilton Monday, July 2 – Wednesday, July 4th – just look out for the Chair and the camera if you want to share your views! As part of the awareness component of this plan, we wanted to provide the youth with an opportunity to be creative and engage in the road safety discussion. To that end, we have created a Road Safety Video competition for youth aged 13 to 18 years old. Teens – create a 30 sec – 90 sec video on the topic “Why is Road Safety Important?” and submit it to bdaroadsafety@gmail.com. Your name, your age and a parent’s contact number must be included in the email. Prizes will be awarded, as well as the winning video will be used in future road safety campaigns. The deadline for video submissions is Friday, July 6th, 2018 so send in those videos! 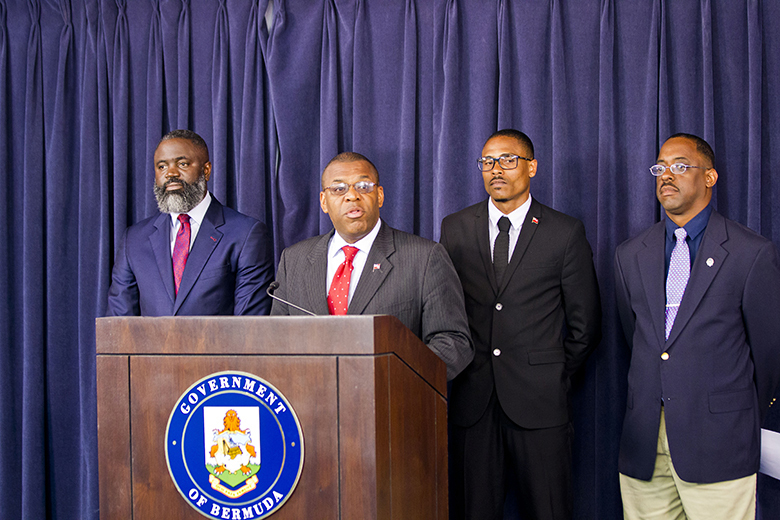 Our thanks to Minister Roban, Minister Caines, Chairman Lister, the Ministry team, the entire TCD team and the members of the BRSC for their commitment to road safety. I look forward to seeing all of you Bermuda as we share the plan moving forward. Thank you. Sort of like a Scared Straight programme, perhaps persons committed of dangerous driving or driving under the influence can be required to assist the families who are caring for persons who have been severely injured on the road, like families featured in the Piece of the Rock film. This might give them the needed reality check. That would be an excellent idea. We need to drive the point home to those who choose to drive recklessly, you aren’t only endangering yourselves but others as well. And the cars that seem to think they can over take the pedal cyclist, who have the same amount of rights as you, pushing them over . And the motorbikes that think they can go right to the front at stop lights. Illegal here, and everywhere else. But not enforced here. There is nothing in these statements that mentions any budget. when Ministers drive properly,then maybe others might too! there needs to be a complete cultural change when it comes to drunk driving. right now although it’s illegal, it’s merely ‘frowned upon’ in our culture. there is hardly any stigma attached to this and people of all socioeconomic backgrounds freely and regularly drive drunk. but in their minds it’s OK because they’re just a little drunk. or they’re so used to doing it and they so often don’t get caught or get in accidents that they don’t understand the true nature of what they’re doing. you can argue that people have to be responsible for their own actions but it’s clear that since the punishments for getting caught are so light (relatively speaking) people regularly flout the law in this area. it may sound crazy to people NOW, but it’s really not when you consider how many lives have needlessly been lost or taken due to drunk driving. not to mention the healthcare costs due to accidents and the property damage and vehicle damage which again causes EVERYONE’s Insurance rates to rise. drunk driving should be an automatic year in jail. maybe then people would think twice. A year in jail? You don’t have enough prison cells for that! How stupid can you be? That’s just it- you clearly don’t seem to have an understanding of how damaging and dangerous drunk driving is. This is why we need much more harsh punishments. I’m happy to fill our prisons with people who put the lives of each one of us at risk every time they get behind the wheel. You asked how stupid can someone be? How stupid do you have to be to drive drunk which is like firing a loaded weapon recklessly?! If people know the law and STILL choose to break it then it’ll be their stupidity for choosing to go behind bars. And again, drunk driving causes the loss of lives (most road fatalities are due to drunk driving- FACT!i) and it costs each one of us ridiculous amounts of money in health insurance costs, and car/bike insurance costs. You do realize that insurers set your premiums in order to cover the costs of the damage drunk drivers do, right? Drunk driving is 100% preventable and yet we have this silly attitude that we can’t be so tough on it because that’s “stupid”. Well stop complaining about insurance costs and don’t cry when people keep dying on our roads. Because we have a real opportunity to change the culture and people’s approach to drunk driving, but apparently people like you are unwilling to do it. Shame! Drunk driving is a major contributing factor, but are we never going to get to grips with driving under the influence of illegal drugs? Even just a little ‘weed’ impairs your abilities, and yet we never mention or attempt to test for marijuana. What about all the other illegal drugs that are in use and are never tested for in accidents. I hope this new Commioner is capable of thinking outside the drunk driving box and ensures the courts punish driving drug offenders accordingly. Are there any deterrents for driving under the influence of drugs? What about pharmaceutical drugs and lack of sleep? Even just a little alcohol impairs but there is an allowable amount, go figure. Weed does not you biased liar. Government tests in Britain proved it does not affect driving but actually makes you drive safer. So quit your stupid theories and prejudices. Having a single beer is stronger than smoking cannabis, so perhaps you should stop while you are ahead of yourself. Cannabis is medicine and how dare you people try to keep it from the populace. That sick tyrannical time of control is soon ending and thank God. Bad drivers cause accidents. Pulling out of driveways without looking, not indicating. certain people here do that every day and I encounter this every day. Fix that! Speed is not the issue! This island is pathetic when it comes to maturity. Now that is absolute nonsense. While I’m in total agreement with your examples of bad driving your comment about herb is totally off the wall. You obviously missed the expose on TV recently concerning what has been going on on the roads of Colorado since legalization and the fact that Florida is now doing a big crackdown on driving while high. So I guess t’s not true at all that weed makes anyone a safer driver. Repeating a lie often enough doesn’t suddenly make it a truth. I sat at crow lane buss stop early this morning to witness 30 minutes of Mahem. It has got to be something they put in the water ? All the expensive gadgets in the world, even with night vision, will not solve the problems, how does a camera tell drunk from tired. We can not service the bus let alone all the electronics with Bermuda salty climate. Cars and bikes don’t speed, people do ! All is needed is to legislate graduated higher fines, all that takes is two seconds with the stroke of the pen on the Hill. You know we hold the power of the VOTE ! Do they teach kids to tell the time in school ?………… I think not ! Is the Speed limit these days, WHAT EVER , ot the National past time? It costs Government more to collect a parking fine, in man hours and paper records than the amount of the fine collected. Who is paying for Court Costs and the Police service for a simple speeeeeeeeeding ticket ? In 2008 an Electronic Vehicle Registration System was put in place to catch offending motorist whose vehicles were not licenced. The system, verifies whether or not a car has been licensed or insured at the time it was being driven on the Island’s roads. I believe there were 4 locations set up and each car had a Radio Frequency ID (RFID) tag on the window screen. I do not think this is in operation and has been the case for quite a long time. If this system can not be maintained and monitored, how are speed cameras etc going to make it?